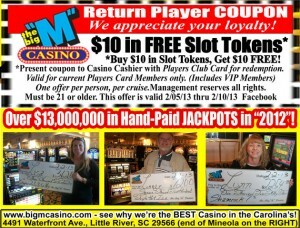 Enjoy the highest hand-paid jackpots in South Carolina, the highest table limits, and a cash back players club! 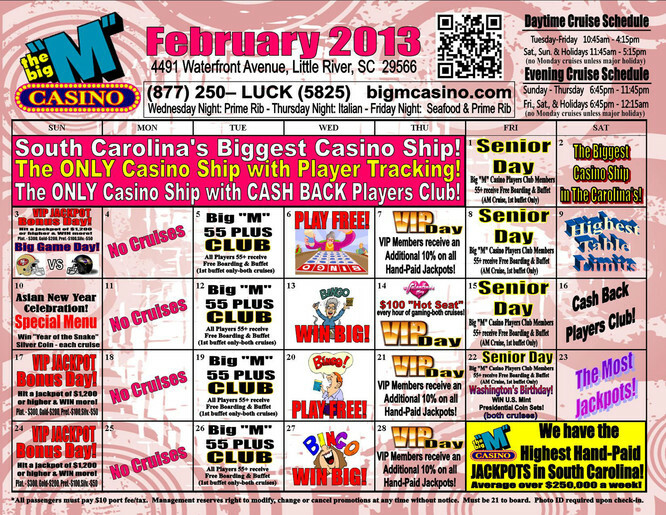 Check out all our monthly specials posted on the Big “M” Casino calendar. Saturdays – Fun! Fun! Fun! 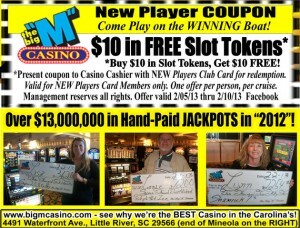 February 5th – 10th new players and return players can Win $10.00 in FREE Slot Tokens! Don’t miss this great opportunity! Just bring in the New Player Coupon or Return Player Coupon, (right)! Check our Events Calendar page weekly for our updated coupons! Ready to p lay Blackjack, Roulette, Craps, Let It Ride, 3 Card Poker or Dice? Or do you prefer our slot machines? Then you’ll “LOVE” our new nickel slots! Interested in joining us for some Carolina gambling? Have questions? Need directions? Contact us or call us at (877) 250-LUCK (5825).